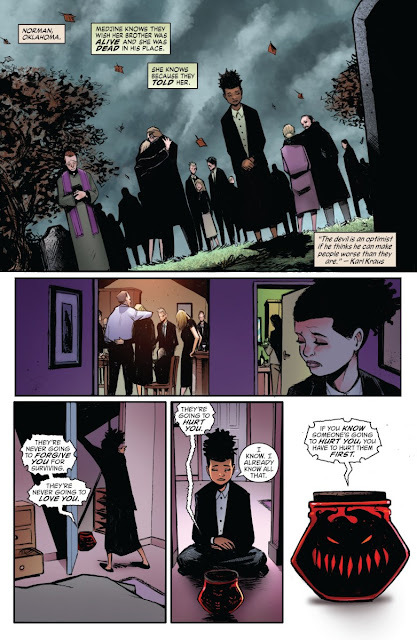 LUCIFER #4 Review | Warped Factor - Words in the Key of Geek. 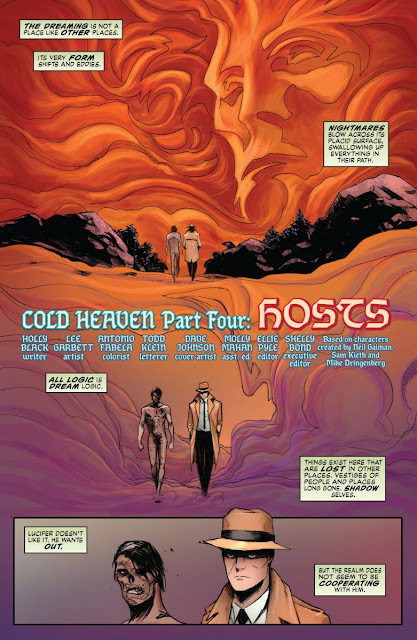 Lucifer #4 opens with Medjine. She stands alone at the funeral of her adopted brother. It's clear that the family blame her for his death, and the demon in the jar is more than happy to keep reminding her of that. Lucifer and Gabriel are still trudging through the Dreaming. I'm not sure why Lucifer is dressed like a 1940s American private eye, but he’s in a better position than Gabriel who’s without clothes and not entirely covered with skin yet either. The good thing is that Lucifer thinks he knows a way out, a back door. While finding the way out, Lucifer finds a pair of his own wings. It turns out that he’d left a feather behind and a new pair had been grown from it. Little wonder then that he sews them onto Gabriel’s back to save him the burden of carrying and flying which aggravates the injury he’s trying hard to disguise. As it happens, our erstwhile angels aren’t the only ones looking for a way out. Medjine has asked her real brother if she can stay with him, and she’s run away – with the demon in a jar. On her travels she bumps into Lorin, who has been conspicuous by his absence the last few issues. The two pairs are on a dangerous collision course, what will happen when they met? 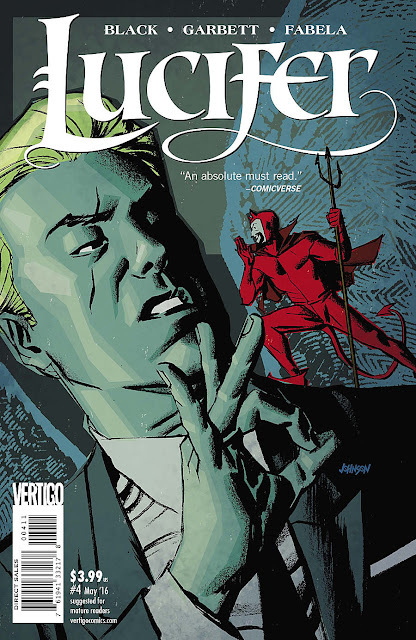 Although it’s taken me a while to get around to reading this #4 of this series, I still find Lucifer a good and enjoyable read. The standard of storytelling and artwork has kept up well through the issues, though I can’t say I like the cover art on this one. 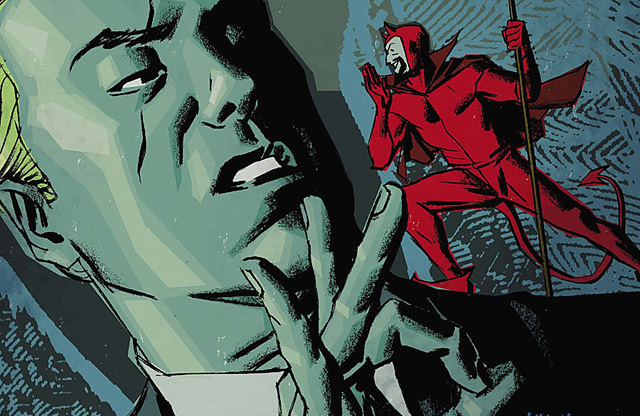 As there is nothing outstanding about issue #4, I’d give it an average three, but it’s still a good read.